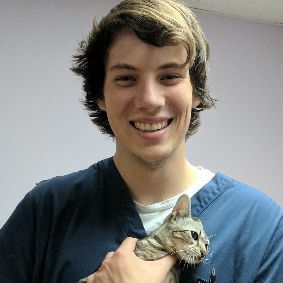 David joined the Ridgewood team in the summer of 2017 as a Veterinary Assistant. He was born and and raised in Chesterfield, Virginia and moved to the Lynchburg/Forest area to continue his and his fiance' (Sarah's) schooling. He has always loved working with animals, and loves helping working with people. He is currently completing his coursework to become a Physician's Assistant. He currently has a beagle mix named Dakota and a long haired tabby named Danny. In his personal time, David enjoys sports such as basketball and football, as well as working out and running.